A Dynamic Entrance - Welcome To All Who Are Ready To Move & Learn! ​to building as a class and as a school community. Creating a learning environment that meets a child's need for safety absent of stress and threat has to be one of the first considerations in building routines & rituals. Our school has chosen to focus on helping students build the character strengths used by KIPP schools of grit, zest, curiosity, optimism, social intelligence, self-control (school work & interpersonal) and gratitude. This created a natural link for me as I focus on helping students build the skills necessary for positive personal and social interactions that respect self and others in physical education. 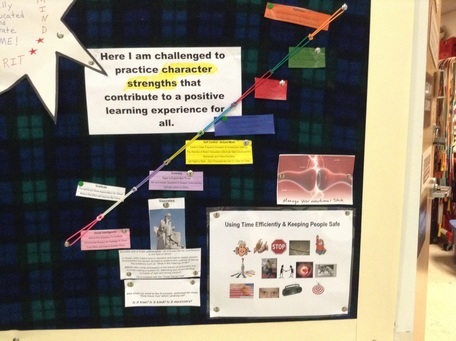 It also creates a common language and focus for us as a school community and helps us create connections between character strengths and success across all subjects. These strengths encompass the habits of mind it takes achieve one's goals. At school community meetings each month classes take turns preparing a presentation on one of the strengths, we have our character compass posted on a common bulletin board, we use this language in the common areas (lunch, hallways, recess) and each teacher completes an assessment for each child in each subject area on all of the criteria for each strength. I front load every lesson with character by having students connect to the character strengths by setting a personal goal or intention before they start their dynamic warm-up. This helps each child begin their time with me by focusing on and sharing how they will be a positive member of class. ​In this way they are getting their bodies and brains ready for physical education. As they enter the gym they hear the dynamic warm-up music (most of which has been chosen by the classes and arranged in playlists on my iPod). First and second grades enter and immediately go straight to a dynamic warm-up walk choosing movements that challenge balance and flexibility. If you look at the image of the character section of the bulletin board you can see that each character trait is connected to a color. This use of color creates an episodic memory tool that has helped the kids remember the traits. And those things that look like colored rubber bands are jelly bracelets. For first and second grades I wear the color representing the character strength of the day. As I interact with students as they enter class they are challenged to identify the character trait that goes with the color. I ask them to think of different choices they can make during class to build that character strength within themselves as they participate with others in class activities. This takes a very short time and is a great way to get them thinking about how they might be successful. Third and fourth grade students walk in, visit the bulletin board, choose a character strength to focus on and then develop an "I'm going to…" sentence. I have a bin of the colored jelly bracelets so if students want to take a reminder of their personal goal or intention they can, wear it for the class period and return it at the end of class. Once they have their choice and a sentence they come to me and tell me, bounding off into their dynamic warm-up. Students in grades 5 through 8 also set a character strength personal goal but they share their goal with a friend first as they start their dynamic warm-up and then with me as I make the rounds. As I greet them I ask them to share their thinking with me. I am always encouraging the older students to try to choose something that is sometimes difficult for them. Teaching K-8 offers a unique opportunity to organize progressions vertically and make sure it really happens. I love watching my students learn and grow over the course of 9 years!! A dynamic warm-up entrance is one of the simplest ways I have found for teaching some fitness content and incorporating that into a class routine that offers choice. It is simple, it takes virtually not time to start and it works very well when all students do not arrive at the same time. Here are some of the ways my students enter the space with music playing and begin moving immediately. Freeze The Action - Open Spaces - Kindergarten students more often than not enter class, find their personal space and begin traveling into open spaces in response to "Can You?" questions. These questions involve response to a variety of locomotor movements and basic movement concepts. They move with the music and "freeze the action" with balance and control when the music stops. I have a great remote and have fun moving with them. Never The Same Move Twice - Students are challenged to travel the perimeter of the room challenging balance and flexibility while raising heart rates. When they get to each corner they must choose a new way to move and never do the same move twice. Flexibility Alley - I designate one end line as "flexibility alley" and students move in a way that stretches his/her muscles. Let The Music Move You - Students enter, start in an open space. When the music starts they move into open spaces, when it stops they freeze the action. When it starts again they move but don't travel performing any non-locomotor movement. The pattern continues - Travel-Freeze-Move In Self-Space-Freeze-Travel-Freeze... I will often pair this with trying to show the music with their bodies, finding the beat, etc... Variation - Divide the group in half with one group striking a balance and the other moving in and around. They alternate each time the music stops and starts. Dynamic Warm-Up - After connecting to character and setting a goal they begin their dynamic warm-up. This group is further challenged to apply the concepts of unison, symmetry, asymmetry, and other movement concepts that make things a bit more interesting. They will often travel with a friend and work together to brainstorm different moves that challenge their balance and flexibility. Dynamic Warm-Up in 3 Planes of Motion - These groups learn and review movement in the 3 planes of motion (sagittal, transverse and frontal) at the beginning of each year and work alone or with others to develop a routine that challenges balance and flexibility in all 3 planes. I have done this in a number of ways. One year they were in cooperative groups, assigned a plane and created a move. Then we jigsawed all the moves in the various planes together in a class dynamic warm-up. I've also done it where groups created a warm-up - the criteria being it had to have moves in all 3 planes while challenging balance and flexibility. 2. Dynamic warm-up moves could be created for specific physical activities or sports, thus pairing the movements with the unit being taught. I have found that these routines connect the kids physically to learning in physical education and puts them in the right state of mind for a productive class. It also gives me an opportunity to visit with students as they enter and make individual connections based on previous class experiences. They also have a built in opportunities to meet basic needs of choice and safety.